Having temporarily moved to Melbourne, I have been in the unusual situation of working out of my bedroom. As a long-time exponent of working from home, I was surprised to find this situation very challenging. With several project dead-lines looming, there was little opportunity to get out and about. With this in mind, I decided to try out a few of the co-working spaces across Melbourne. Initially sceptical if any real work could be achieved in these spaces, I have been surprised to discover just how great co-working can be. Essentially a co-working space is a flexible work environment shared by people running independent businesses or projects. Often a large open area, the spaces are typically occupied by consultants, contractors, freelancers and startups. Most offer hot-desk options, from 1 to 5 days per week, as well as fixed desk locations, where you can setup permanently. Access agreements are typically monthly or quarterly, with almost all spaces offering a 1-day free trial. All spaces offer high speed Internet, kitchen and coffee facilities, meeting rooms and 24×7 access. Common extras often include high quality printing, ergonomic chairs, phone answering services, mailboxes, storage, support groups and mentoring. Some of the larger spaces have regular community events and classes for yoga and meditation, guest speakers, accountability groups, lunches, evening drinks and networking events. One of the major complaints of long-term at home workers is social isolation and loneliness. So crucially, co-working spaces provide a sense of community, and opportunities to make new contacts and friends. Even if you are not often speaking with those working around you, the spaces tend to have a background hum of comforting energy. Being surrounded by people excited to be working on their business or startup venture is contagious. According to a Deskmag (2010) study on co-working, 85% of respondents said they were more motivated since moving into a co-working space. I have personally found it impossible not to be focused in this type of environment. You also are unlikely to be running to the fridge or TV every 5 minutes for a distraction break. Sure, you can’t just roll out of bed and get to work. However I submit that working in your pyjamas is only fun for so long, especially when clients drop past unexpectedly. Creating physical separation between home and work is a better approach over the longer term. Getting up and ready, heading outside for some sunshine and off to work, is of great benefit to your physical and mental well-being. Unless you are out participating, you are not going to expand your business network. On my first tour of a co-working space, I met a programmer working on building a mobile phone app. This common interest resulted in lunch and instant collaboration on a project. 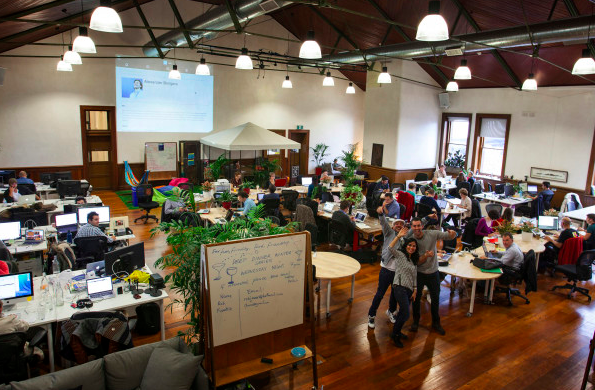 There is no doubt when coworking, you are going to meet like-minded people on similar journeys, ready to share their experience and connect you into their network. Often my phone runs off the hook, so my first question was, can I use my phone and will I have to whisper? It turns out that most co-working spaces are noisy. People are constantly taking calls, some quieter than others. As a result many work with head-phones on. With that said, depending on your style of work, it is important to find a co-working space that suits you. If you need total silence to get work done, co-working might not be for you. Choose a co-working space you can get to easily on public transport. Most are near the city, so driving in and finding parking during peak-hour is not going to inspire you to leave the comfort of your home-office. Coworking needs to be easy, otherwise you won’t make the effort to get there each day. Some coworking environments are much louder and busier than others. Is a broken brick basement more your style, or the top of skyscraper with stunning views and light? Do you prefer a casual creative space, or do you need a corporate office style to impress your clients? Take the time to check out the different spaces to find one that suits. So my fellow entrepreneurs, if your work day never seems to end, and you are constantly distracted by family, fridge or facebook, get yourself down to a co-working space for a tour ASAP! Inspired Business is focused on providing Christian business owners with content that will assist owners in building, strong, wise, well equipped companies that ultimately glorify God. We partner with you and supply you with the tools to reach business and Godly goals in the every day.